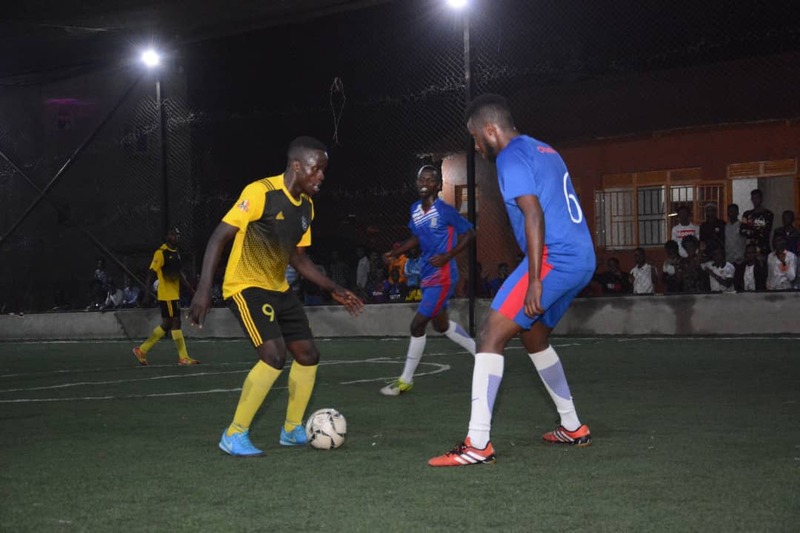 MENGO – There were a League high 53 goals scored in the 7 Futsal Super League games played on Thursday evening at the International Futsal Courts in Mengo. The highest scoring encounter saw 14 goals as Elephants and Bajim shared spoils in a 7-7 draw. Elephants’ Collins Muhumuza scored five with Bruno Ssegilinya and Eric Wagana banging in the other two. For Bajim, Jimmy Zziwa, Titus Ssematimba and Franco Sunday banged a brace each while the other was scored off an own goal. The thriller means that Bajim drop into 9th on the log with 16 points while Elephants remain 11th on 8 points. In the first game of the evening, Parakeets who had gone two minus victory, drubbed Crown 6-3 to return to winning ways. After and intense first period that ended 2-2, Parakeets ran riot, scoring 4 more in the second as compared to Crown’s one. Borris Onegi and Arafat Ssentongo each scored a hat trick for Parakeets while Crown found the back of the net through Salid Mohad (×2) and Ahmed Adfatah. Parakeets now move back into second position on the log with 25 points while Crown drop to 6th, 3 points behind Parakeets and 7 adrift of top spot. Talking of top spot, it is till occupied by the rampant Yeak Kabowa who destroyed Aidenal 8-0 on the evening. After a first period which ended 2-0 with both Abdul Mugenyi and John Musasizi getting onto the score-sheet, Yeak ran riot in the second, scoring six more goals. Enock Ssebagala score d four of the six while each of Emmanuel Nsamba and Jovan Mawejje struck once. The result means that Yeak stay onto for a third consecutive game week with 29 points from the first 15 games. They are four points clear of Parakeets in second. For Aidenal, they remain 10th with 12 points. Elsewhere, defending champions Dream walloped Yap Stars 9-1 in the encounter played at 7pm. Dream who seem to be picking form lately after an inconsistent start, took command of the game from the on-set and by the sound of the half-time whistle, they led by as many as five (5-0). In the second they scored four more and despite Yap pulling one back off an own goal, the damage was already done. Captain Jamal Muyingo scored a treble to continue his fine scoring form while Said Sadam got two. Swaibu Kazibwe, John Ssegawa and Ali Kiseka were the others on target for Dream. Dream now move into 5th on the standings with 22 points while Yap remain rooted at the bottom with 6 points. In the other games played, Kabowa United lost 2-1 against Nomad, Park were 3-2 winners over Typhoon while Mengo bashed aside Equator 3-1. Yeak’s Shafick Avemah still tops the scoring charts with 24 goals, five ahead of Park’s Joseph Bukenya. The Futsal Super League resumes next Thursday with 7 games.